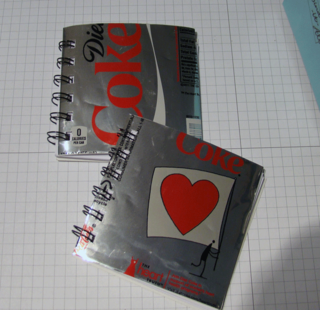 To celebrate Earth Day The Two Paper Divas created these super cute mini notebooks made from recycled coke cans. I am a huge fan of upcycling products and this mini is definitely a great way to both create something fab and useful and show our planet a bit of love. The Two Paper Diva gals have a breif tutorial on their blog to show you how to make these soda can notebooks. Note - they are made with the handy bind it all. I'm reading: Coca Cola Can Mini ScrapbookTweet this! How do you make it so that the metal doesn't cut someone reading/looking at your mini album? I would very much like to subscribe to your blog via email! Is that a possiblity? And Char has a good point are the edges/corners sharp? Awww it's so creative !! Wuaoooo me encanta tu idea! I love this. I was thinking a cool idea would be to use some rhinestones to simulate condensation on the cover.